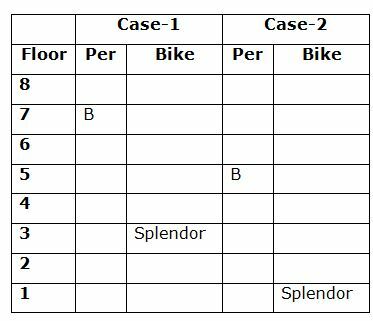 Eight persons A, B, C, D, E, F, G, and H are living on eight storey building in such a way that the ground floor is numbered one, the above one is numbered two and so on till the topmost floor is numbered eight. They all are having different bikes viz., Platina, Pulsar, Hunk, Shine, Apache, Splendor, Crux and Activa but not necessary in the same order. C does not live on even numbered floor.Only three persons are living between the one who has Splendor and B. As many persons living above D is same as the persons living below the one who has Activa. Two persons are living between the one who has Activa and the one who has Hunk. B does not has Hunk. The one who has Apache lives immediately above the one who has Pulsar. Three persons are living between G and the one who has Pulsar. G has Platina. The one who has crux lives immediately below F. As many persons living between F and the one who has Activa is same as between H and the one who has Crux. E does not has Hunk and Activa. B lives one of the floors above the one who has Splendor but not lives on even numbered floor.Only one person lives between D and the one who has Splendor. 1. A has which of the following bikes? Only three persons are living between the one who has Splendor and B. B lives one of the floors above the one who has Splendor but not lives on even numbered floor. Only one person lives between D and the one who has Splendor. As many persons living above D is same as the persons living below the one who has Activa. Two persons are living between the one who has Activa and the one who has Hunk. B does not has Hunk. 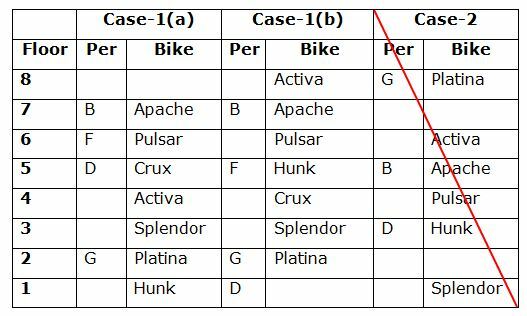 The one who has Apache lives immediately above the one who has Pulsar. Three persons are living between G and the one who has Pulsar. G has Platina. The one who has crux lives immediately below F.
As many persons living between F and the one who has Activa is same as between H and the one who has Crux. E does not has Hunk and Activa. C does not live on even numbered floor. 4. 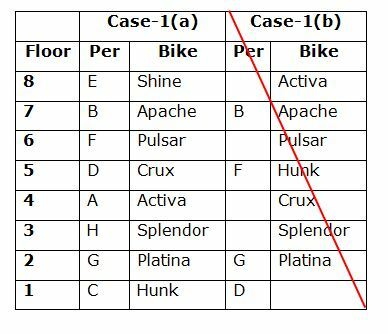 How many persons are living between B and the one who has Crux? 5. Who among the following persons lives immediately above the one who has Platina? 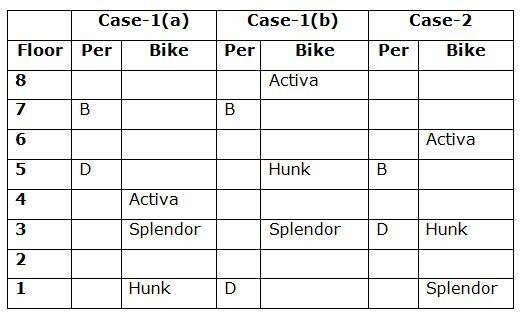 1) A has which of the following bikes? 4) How many persons are living between B and the one who has Crux? 5) Who among the following persons lives immediately above the one who has Platina?